One of my favorites! 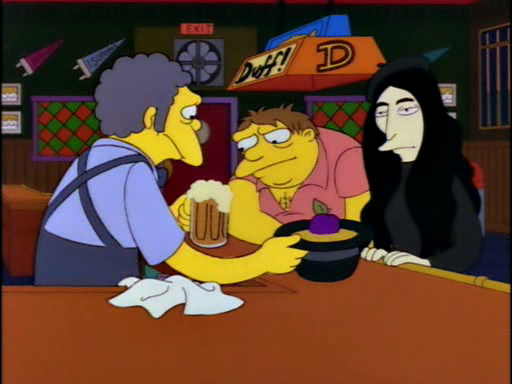 I love how Moe happens to have the plum-in-hat drink under the bar along with the beer. Perfumes usually contain alcohol, so yeah, it checks out. So I wonder if we could invent a drink for “single plum, floating in perfume, served in a man’s hat”. Any creative alcoholophiles here? Be sure to have a significant other nearby though, because three of these will send your caramba up faster than Simpson & Son tonic.